Challenger Approaching Special: How "Limiting" is the 3DS? What happens when the newest addition to a well known and highly anticipated game is announced as "limited" due to it's alignment with a portable counterpart? Outrage, that's what. 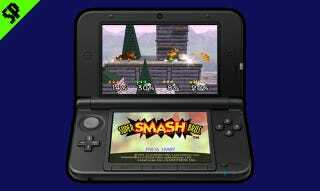 But is the 3DS really going to bog down the upcoming Smash Bros roster? Many fans of Smash Bros and gamers in general have pointed out that Smash creator Masahiro Sakurai has already announced a smaller roster than that of Super Smash Bros Brawl, but this is not the case. Let's look at what he really said about the roster. There has been no official statement as to whether or not the roster for the upcoming Smash Bros 4 will be smaller or larger than Smash Bros Brawl, but how much CAN the 3DS handle? The 3DS has featured quite a few fighting games in its short life span. These games have included a vast amount of characters with rosters at times ranging higher than 39 (the amount of characters in Brawl). These games prove that the 3DS is quite the power house when it comes to including loads of multiple characters in fighting games, or any other kind of game for that matter. Even with that being said it should be noted that 3DS games cartridges can hold from 1 to 8 gigs of data. Tekken 3D Prime was created on a 2 gig cartridge, nowhere near the apex for 3DS capabilities and yet it still included over 40 characters. It's very possible that Smash Bros 4 could feature over 50 characters, though I'd say it'll most likely top out around 45 with Nintendo making a few cuts from the prior roster. To be fair, Smash Bros Brawl was a very large game, especially for the Wii. It clocked in at 7.47 gigs and featured a dual layer disc, but we already know that certain aspects of the game are being cut or retooled for the newest Smash title. Recently Sakurai confirmed that the adventure mode "Subspace Emissary" would not be returning for Smash Bros 4. This frees up an enormous chunk of space (no pun intended) on its own due to the vast amount of cut scenes, areas, and enemies that the Subspace Emissary featured. So assuming that Nintendo is smart and doesn't bog down their newest arena brawler with some newfangled adventure mode or overload it with gratuitous trophies and stickers we very well may end up with the roster we had hoped for. Bigger, better, and this time... portable.